Dubai: Shopping isn’t all about draining one’s bank account. It can turn spending into financial rewards, too, at least for some fortunate few. 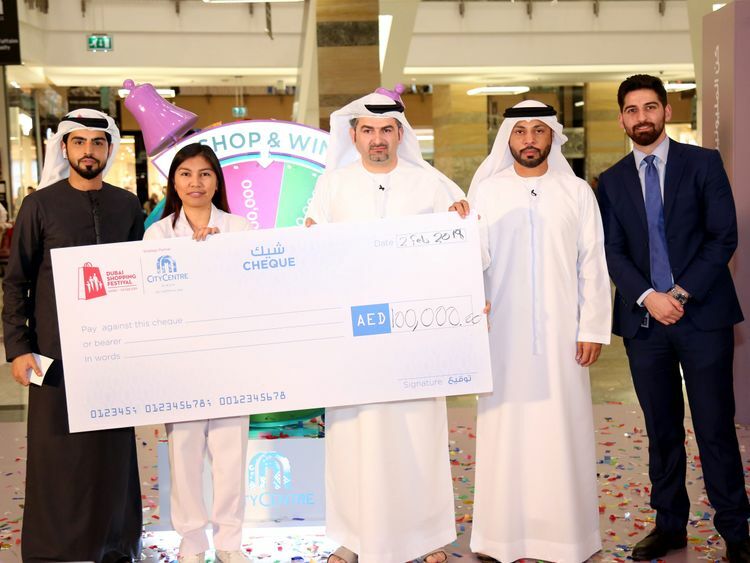 One such lucky person is Angela Mortos, a Filipino expatriate who recently walked away with Dh100,000 from a shopping mall in the UAE. The Dubai-based nurse had spent a total of Dh2,000 on several visits to City Centre Mirdif during the Dubai Shopping Festival (DSF) that concluded this weekend. Her purchases made her eligible to join the mall’s Million Dirham Wheel campaign. And when it was her turn to spin the specially designed raffle wheel, Mortos hit the Dh100,000 jackpot, which is equivalent to 1.4 million pesos, making her an instant millionaire in her home country. “When they first called me, I didn’t pay much attention to it because I was with patients at the medical centre that I work for,” the nurse said. She also plans to spend some of the money to fix the graveyard of her deceased parents. “They died about ten years ago and their graves need attention. So, this is definitely something the money will go towards,” she added. The mall collaborated with the Dubai Festivals and Retail Establishment to give shoppers a chance to win cash prizes during the DSF campaign.